A chemical weapons attack that killed more than 80 people, including children, triggered the Trump administration’s recent missile strikes against the Syrian government. The use of illegal nerve agents – apparently by the Assad regime – violated international law; President Trump said he was moved to act by images of the victims’ horrible deaths. But there’s another path to mitigate the danger of chemical weapons. This route lies within the domains of science – the very same science that produced chemical weapons in the first place. Researchers in the U.S. and around the world, including here at the University of Washington’s Institute for Protein Design, are developing the tools needed to quickly and safely destroy nerve agents – both in storage facilities and in the human body. 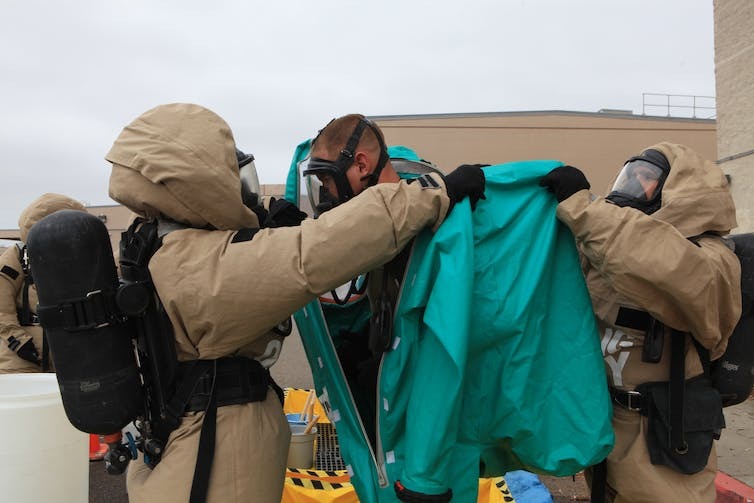 U.S. Marine Corps specialists performing decontamination procedures. Sgt. Keonaona Paulo. Chemical weapons are often associated with wars of the previous century – mustard gas in WWI, Zyklon B in WWII. But the worst variety, nerve agents, were never deployed in the world wars, though Nazi scientists developed the first generation of these compounds. Gerhard Schrader, the so-called father of nerve agents, didn’t begin life as a Nazi scientist – he was developing new pesticides to combat world hunger when he accidentally synthesized the first organophosphorus nerve agent. Later, he led the research team that produced sarin, or GB, the most toxic of the all the so-called G-series nerve agents. The U.S. government stated with “very high confidence” that sarin was used in the recent attack near Idlib, Syria. Beginning in 2013, teams from the Organization for the Prohibition of Chemical Weapons went to Syria and, with help from the Danish, Norwegian, Russian, Chinese and U.S. government, destroyed all declared stockpiles of Syrian chemical weapons. It seems that either not all of Assad’s stockpiles were in fact declared and destroyed, or that new nerve agents arrived in Syria – either via the black market or chemical synthesis – in the intervening years. Empty sarin containers at Pine Bluff Arsenal. U.S. Army. Sarin sitting in a container – as opposed to in a human body – is relatively easy to destroy. The simplest method is to add a soluble base and heat the mixture to near-boiling temperatures. After several hours, the vast majority – more than 99.9 percent – of the deadly compound can be broken apart by a process called hydrolysis. 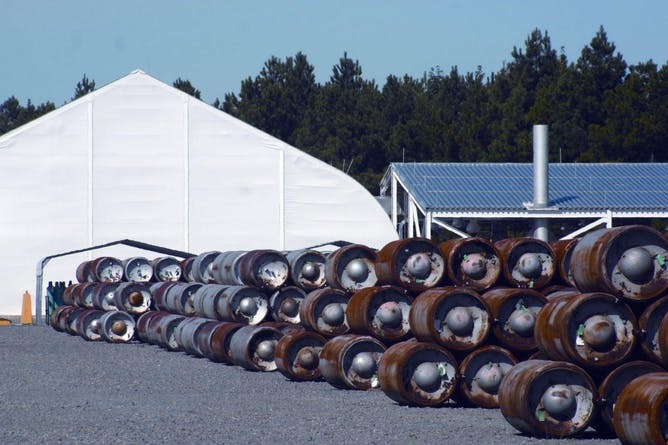 This is how trained specialists dispose of chemical weapons like sarin. For a medical intervention to work after nerve gas exposure, it has to work fast. If a first responder administers a sarin-destroying molecule, each therapeutic molecule must be capable of breaking down through hydrolysis hundreds of nerve agent molecules per second, one after another. Aside from their astonishing speed, enzymes often display an equally impressive selectivity. That is, they react with only a small number of structurally similar compounds and leave all other compounds alone. Selectivity is useful in the context of the chemical soup that is the cell but problematic when it comes to xenobiotics: those compounds which are foreign to one’s biology. Man-made organophosphates such as sarin are xenobiotics. There are no enzymes that hydrolyze them well – or so we thought. 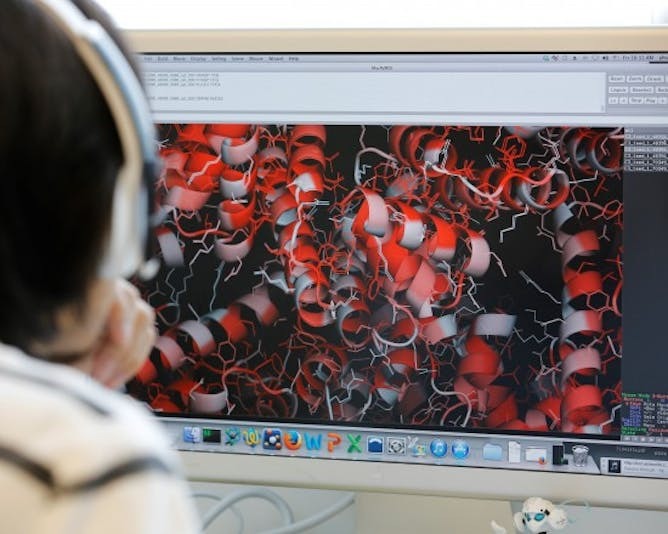 Scientists are using computers to design a new generation of proteins to solve 21st-century problems. UW Institute for Protein Design, CC BY-ND. Featured image: Sgt. Dave Jones, a member of the 58th Tactical Fighter Wing weapons section, checks the fins on an AIM-9 Sidewinder missile during a simulated chemical warfare exercise in support of Exercise Nomad Thrust ’88. US Military.